This is rock and roll... This is Howler. Their debut album, America Give Up, is vigorous and catchy much like one of my favorite bands of 2011, The Vaccines. The Drums, Surfer Blood and The Soft Pack (plug in other surf-rock influenced band name here) also come to mind, because the surf-rock trend is so hot right now. The 11 track album comes in at just over 32 minutes, which leaves each riff-laden, power pop track to come and go at a '70s punk pace. It is truly structured as an album from a different era. 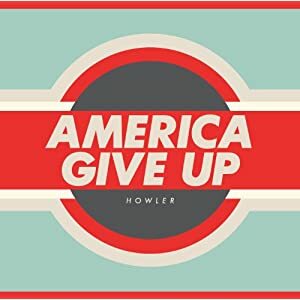 I suppose we shouldn't be surprised anymore due to all the musical virtuosos currently on the prowl, but I am still amazed by the fact that Howler is made up of mere kids. They pull together an amazingly mature and musically-educated sound, while keeping the songs and song-titles playful and carefree. This album is packed with singles, so take a half-hour out of your day, especially while the sun is shining here in California, and have a listen to some youthful summer jammy-jams. Nice find. I am going to have to check these guys out. From your description, they could be my new favorite band. I listen to this album all the time on Spotify... really like it. Go Minnesota! Go youth!